Solutions for meeting water needs in different communities are often ad-hoc, and based on massive projects whose after-effects are rarely monitored and controlled. Himanshu Upadhyaya investigates the reasons behind the collapse of a major Narmada canal, and finds that nature is unforgiving. Come September, and short-lived, mirage-like images of flowing water are back in the news again. This year, the monsoon's fleeting bounty has been fed by the Gujarat Chief Minister to grace the occassion of recreating the Narmada-Saraswati confluence, and the media dutifully reported the pouring of the Narmada waters on to the dry riverbed of the Saraswati. Perhaps this kind of 'use' is par for the course in politics. The average farmer is gazing endlessly at the power lines over his land, hoping for power supply without unscheduled cuts and load shedding. And the rains have played truant after initial downpours, raising the possibility of shortages again later this year and in the first half of 2006. But reviving the lost Saraswati - and flexing cultural muscles alongside - is the highest political priority. While the average Gujarati is left to survive on a diet of past glory, it is an opportune time for us to ask a few related questions: why do rivers cease to flow? When do riverine communities lose their precious resources? Let's revisit what happened last year in the command area of the Sardar Sarovar Project; some of the answers can be found here. In early August last year a news release from the Meteorology department in Gujarat stated that while in the third week of July, 187 talukas out of 255 had received less than 35% of their normal rainfall, by the first week of August only 27 talukas were in such a grim state; the others have received enough rain in the interim to be more optimistic. These 27 talukas were in Ahmedabad, Mehsana, Banaskantha, Kutch, Jamnagar, Panch Mahal and Surendranagar districts; additionally Junagadh and Narmada districts still remained on the border of vulnerability to shortages. At the Sardar Sarovar dam itself, although the state government had been able to raise the height of the dam across the Narmada to 110.64 metres, the actual storage position had just touched 98.24 metres. So I was surprised to read a different news release from UNI on August 3, stating that at least seven villages in Pavi Jetpur and Sankheda talukas of Vadodara district were inundated as the flooded Narmada Main canal had been breached at two locations near Bodeli, rendering hundreds of villagers homeless. This was all the more suprising, as I couldn't find any corresponding reports of heavy rainfall in the catchment areas of Sardar Sarovar, nor any reports of the Narmada river being in spate upstream of the Sardar Sarovar Dam due to release from upstream dams. The likely explanation for all this was that the canal was breached because of heavy rainfall locally - this might have caused the Heran river to overflow - but could this have collapsed even the much-touted Wonder Canal? Within a week, on the afternoon of August 11 last year, I received another release - this time from PTI Bhasha - bringing news of another breach in the Narmada canal near Viramgam taluka in Ahmedabad district, forcing the administration to evacuate people from low-lying areas. 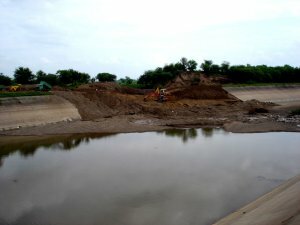 K N Rawal, a superintendent engineer, spoke to a journalist with The Indian Express, "Since the level of Narmada canal was at a lower level than Heran river and its Borda tributary, the excess water from the river flowed into the canal, thus helping in receding the water level in the river and its tributary." This was even more surprising. Not only did the Narmada not overflow into the canals, the breaches were not caused by the flooding of local rivers from heavy rainfall nearby either. In fact those local rivers were at a lower level than the canal, and could accommodate the overflow from the canal! I decided that a visit to the villages near the breaches would help. What I discovered, on getting there, was this: the grandiose canal network of Sardar Sarovar Project had wreaked havoc on the drainage pattern of the region. A stream of the Heran river flows under the canal in the vicinity of Borda village through concrete siphons. Two kilometres upstream from this point is an abandoned irrigation infrastructure from Nehruvian socialist India - the Heran Dam. The highest flood levels in the river at this place were measured to be 197 feet in the year 1957 and 198 feet in 1967. The red marking of these levels - with the letters HFL - was still prominently visible, as was the white marble embodiment declaring that the foundation stone for the project was laid down by the Public Works Minister of Bombay State in 1954. But there is no longer any capacity to hold a 150 feet of water anywhere near this site. Decades of neglect have led to a build-up of silt that has gradually raised the Heran's riverbed. Not only the villagers but SSP engineers like K N Rawal agree; when the river is in spate, it now flows much higher than the old high-water marks. So that's how the canal was breached; the floodwater from the Heran's tributary which should by design flow under the canal to its western side had instead began pounding against the eastern face of the canal due to silt blockage in the normal passage under the canal. When the siphons on the Canal became choked this created an alarming artificial reservoir on its right bank, submerging the villages. Eventually the tremendous pressure from the waters caved in the embankment of the canal and tore apart its much-touted cement lining as easily as if it were no more than a slice of faded paint on a wall. This year once again when it rained heavily in the command area, we witnessed rehabilitation sites getting waterlogged. The Baroli site in Naswadi taluka, Baroda District was under water because the river couldn't flow under the canal. Four of the five siphons provided for underground inlets were blocked and hence the river turned to its left, cut through a large chunk of land, submerged houses, fields, bullock carts, everything. But the mainstream media, dancing to the tune of the Saraswati-Narmada Maha Sangam is yet to find a space for the representation of this reality. While religious festivals and politically stage-managed shows have always attracted thousands, there is no similar zeal when it comes to cleaning our most polluted rivers, or to keeping them flowing. The country also lacks good documented ecological and historical accounts of rivers, which makes it easy for politicians to write their own ecological histories, as well as similarly unreal futures. Alongside, our infrastructure projects show little regard for drainage or flow patterns. As a result we find umpteen stories of irrigation dams getting silted up due to years of neglect, river waters trapped by elevated expressways that block their flow in spate, rampant deforestation and soil erosion on countless river banks, and flow patterns that have shifted greatly from their original courses. The occassional successes in combating this degradation are from privately-led community efforts, like those of Rajendra Singh leading to the revival of the Aravari and Ruparel. The political establishment has no time for this hard but necessary work. Little wonder, therefore, that rivers whose courses have been distorted grotesquely don't conform to our ill-laid plans. Instead they crash into the sides of our canals, shattering our shallow dreams. Himanshu Upadhyaya is an independent researcher working on Public Finance and Accountability issues.